Lise Skou graduated from the Whitney Museum of American Art – Independent Study Program (2002-2003) and the Funen Art Academy (1998-2004). She also holds a BA (Art History) from Aarhus University. Over the past years Skou have been working on the basis on feminist critique of the political economy. Through different modes of expression – e.i. video, reading performances, texts, long-term platform based and collaborative projects – she explores challenges associated with alternative economic measures and economic diversity. As a method to develop knowledge as part of her artistic practise Skou organises discursive events, seminars and readings to develop different perspectives on contemporary conditions such as precarity, feminized labour and feminist economies. 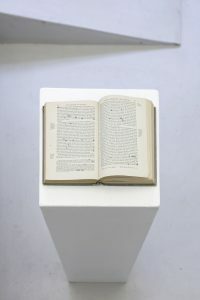 8-16 and The Wealth of Nations Rewritten by Lise Skou, 2018. Photo: Kristian Touborg. The Wealth of Nations Rewritten by Lise Skou, 2018. Photo: Kristian Touborg. If you only want to offer me unpaid work, you can go somewhere else & The Wealth of Nations Rewritten by Lise Skou, 2018. Photo: Kristian Touborg. 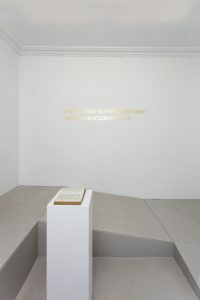 For the exhibition Lise Skou presents the installation Rewriting History that comprises a wall text, an 8 hour long video recorded in one-take of the artist working on rewriting Wealth of a Nations by Adam Smith from 1776, plus the edited version of Wealth of a Nations. 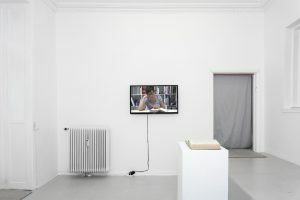 Lise Skou’s focus is on the lacking consideration of how unpaid work ensure wealth.